Davarpanah, Sohrab, Ali Tehranifar, Javier Abadía, Jesús Val, Gholamhossein Davarynejad, Mehdi Aran, and Reza Khorassani. (2018) Foliar Calcium Fertilization Reduces Fruit Cracking in Pomegranate (Punica Granatum Cv. Ardestani). Scientia Horticulturae 230: 86-91. Krawitzky M, Orera I, López-Millán AF, Oria R, Val J. (2016) Identification of bitter pit protein markers in Malus domestica using differential in-gel electrophoresis (DIGE) and LC–MS/MS. Postharvest Biology and Technology 111: 224–239. Lafuente V., Herrera L.J., Pérez M.D., Val J., Negueruela I. (2015) Firmness prediction in Prunus persica ‘Calrico’ peaches by Visible/short wave near infrared spectroscopy and acoustic measurements using optimized linear and non-linear chemometric models. Journal of the Science of Food and Agriculture 95 (10): 2033-2040. Krawitzky M., Arias E., Peiró J.M., Negueruela A.I., Val J., Oria R. (2014) Determination of color, antioxidant activity and phenolic profile of different fruit tissue of Spanish ‘Verde Doncella’ apple cultivar. International Journal of Food Properties 17 (10): 2298-2311. Herremans E., Melado-Herreros A., Defraeye T., Verlinden B., Hertog M., Verboven P., Val J., Fernández-Valle M.E., Bongaers E., Estrade P., Wevers M., Barreiro P., Nicolaï B.M. (2014) Comparison of X-ray CT and MRI of watercore disorder of different apple cultivars. Postharvest Biology and Technology 87: 42-50. Melado-Herreros A., Muñoz-García M.A., Blanco A., Val J., Fernández-Valle E., Barreiro P. (2013) Assessment of watercore development in apples with MRI: Effect of fruit location in the canopy. Postharvest Biology and Technology 86: 125-133. Fernández V., Blanco A., Val J. (2012) Vitrescent dark spot in peach: a preliminary mineral element characterization. Acta Horticulturae 962: 495-498. Val J., Blanco A., Fernández V. (2011) Avances en el control del bitter pit en manzano. Vida Rural 333: 32-35. Fernández V., Khayet M., Montero-Prado P., Heredia-Guerrero J.A., Liakopoulos G., Karabourniotis G., del Río V., Dominguez E., Tacchini I., Nerin C., Val J., Heredia A. (2011) New insights into the properties of pubescent surfaces: peach fruit as a model. Plant Physiology 156 (4): 2098-2108. 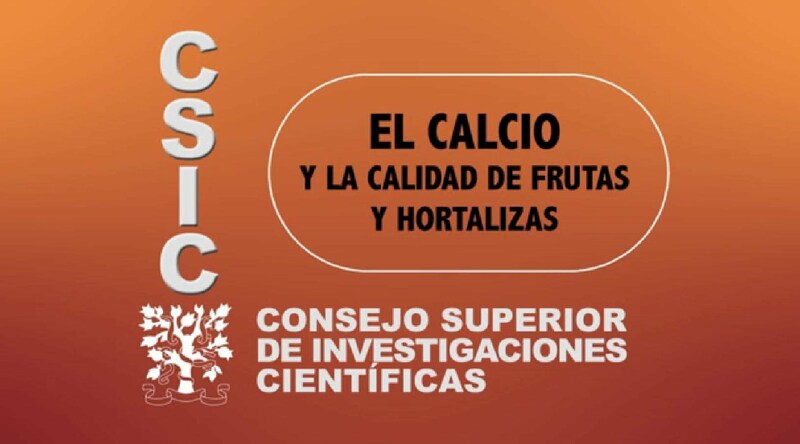 Val J., Fernández V. (2011) In-season calcium-spray formulations improve calcium balance and fruit quality traits of peach. Journal of Plant Nutrition and Soil Science 174: 465-472. Blanco A., Fernández V., Val J. (2010) Improving the performance of calcium-containing spray formulations to limit the incidence of bitter pit in apple (Malus x domestica Borkh). Scientia Horticulturae 127 (1): 23-28. Parés J.L., Monge E., Blanco A., Val J., Espada J.L. 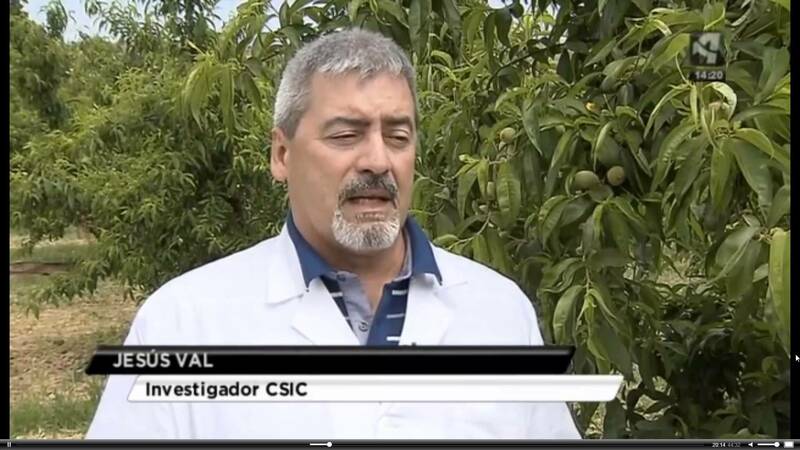 (2010) Study of the effect of Nitrogen fertilization supplied by foliar sprays or by fertigation in apple trees. Acta Horticulturae 868: 287-291. Val J., Monge E., Blanco A., Espada J.L. (2010) The effects of Ca applications on peach fruit mineral content and quality. Acta Horticulturae 868: 405-408. Val J., Fernández V., López P., Peiró J.M., Blanco A. (2010) Low oxygen treatment prior to cold storage decreases the incidence of bitter pit in Golden Reinders apples. Journal of the Science of Food and Agriculture 90 (3): 536-540. Val J., Monge E., Blanco A., Espada J.L. (2010) Polyphenoloxidase isozymes in bitter pit affected apple tissues either natural or locally induced by ammonium oxalate injections. Acta Horticulturae 868: 341-345.